Today there is no shortage of research, tools and analysis on the importance and implications of gender (in-)equality in our society and workplaces. However, as we all know, progress is difficult and slow. Why? Taking a decision is a difficult thing to do by oneself, taking it together in a group can seem impossible. Creating an alchemy of all perspectives into a common agreement is a mastery and ensuring that the individuals then stick to the agreement is wizardry. Yet, collective decision making it is at the heart of a fruitful collaboration and we are confronted by it on a day by day basis. So how do we deal with this challenge? Heute feiern wir die Gründung der Schweizerischen Eidgenossenschaft! Wir alle kennen die sagenumwobene Geschichte des Rütlischwurs, wo die Uhrkantone ein Bündnis schlossen und somit den Gründungsakt der Eidgenossenschaft festlegten. Gründungsmythen haben eine starke kulturelle und verbindende Relevanz, die nicht unterschätzt werden darf. Zum heutigen Nationalfeiertag stellen wir uns zwei Fragen: Wie schaffen Mythen Realitäten und wie sieht die Schweiz aus in der wir leben wollen? How a Dialogue Evening on Sustainable Consumption helped leading change actors to let go of frustration and anger and become more positive towards their actions. Why do many people who try to make a difference often feel frustrated or angered because the world isn’t changing fast enough for them or that some people do not share their awareness about an issue? In this story, leading activists for more sustainable human behaviour feel that they carry the weight of the consumption patterns of 8 billion people on their backs. But this negativity only hinders their contributions for a more sustainable future. In this blog article I share with you my insights from a Dialogue Evening on Sustainable Consumption, and how it offered us some solutions. 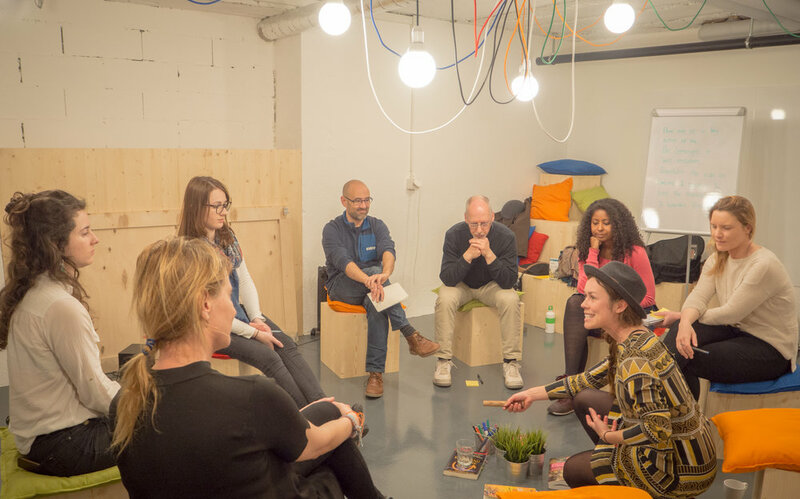 On the evening of April 5th 2018 a group of 9 people gathered in the Impact Hub Lausanne for a Dialogue Evening (see footer) on the topic of Sustainable Consumption, the focus of Sustainable Development Goal 12. It is a topic broadly debated in society. Can we consume sustainably? What does it mean to consume sustainably? How much can we consume now whilst sustaining our planet for future generations? During this Dialogue Evening we were asked to exchange views on our own relationship towards the consumption of food, relationships, money and more. We approached the topic from different angles: How our backgrounds and families shaped our consumption patterns, when in our lives we realized that our consumption comes with consequences or what actually keeps us from changing our behaviour. What struck me during this evening were the negative emotions that some of the people in this group – myself included – expressed during the conversations. Anger, frustration and guilt are often connected to the topic of Sustainable Consumption. It is the feeling of guilt that comes with the consumption of certain goods and the feeling of anger or frustration that leading actors pushing for a change in this topic carry. Consumption is first and foremost a personal matter. It is to some extend about consuming right or wrongly, and this is where our emotions towards the outside gets activated. Living with a permanent sense of frustration with the situation, and anger against those who are perceived not to be changing things despite clearly understood issues and solutions is exhausting and depressing for those trying to drive social change or be socially responsible. What can be done about this? Persistent negativity is not attractive, and activists run the risk of giving up, succumbing to depression or becoming passive. To a certain degree this Dialogue Evening was a first step for a change. While talking and connecting on a deeper level with each other, the group became aware of the anger and frustration in the room. The people present became aware of their emotions and started to question their attitude. Other persons offered support as they saw them struggle to let go of the negativity. Another participant said: “Awareness shouldn’t paralyze you and it shouldn’t frustrate you”. This sentence made quite an impression on me. I often catch myself in situations where I observe other people’s unsustainable behaviour which angers me. Or another moment where I eat something that my sustainable consciousness wouldn’t actually allow – which produces guilt. But these reactions don’t really change anything: It only frustrates me and if I show this feeling against the other person he or her might get upset. What do we take away from the Dialogue Evening? Everybody left this Dialogue Evening with a good feeling. There was no frustration, anger or guilt produced. We listened carefully to each other’s perspectives and experiences. All the people taking part had the chance to reflect on their own behaviour and the feelings coming with it. Everyone took something with her or him and left the evening either motivated, felt understood or maybe just a tiny bit more aware of themselves and their surroundings. We decided to make another Dialogue Evening on June 12th where everybody in the room agreed on taking someone with them that wouldn’t have come her-/himself. Either because they do not care much about the topic or are just not attracted by the format. We will see if and how different the conversations will be. But I am sure that if we approach the new people in the group with the same openness and positivity, a similar positive atmosphere like on this last evening in Lausanne will occur. Intrigued? Join one of the #cohe Dialogue Evenings or contact Sidsel if you want to organise a Dialogue Evening around a specific topic in your community or municipality. A Dialogue Evening is a format that allows a group to exchange on personal and local experiences of a societal challenge. It is all about the quality of listening and speaking. And therein lies the way we can change relationships between us when we dare to deeply listen to others perspectives, ideas and experiences. Isabelle Ruckli is communication manager at collaboratio helvetica. She is highly interested in the nexus of human behaviour, sustainable development, democracy and governance. She wrote this blog article after visiting a Dialogue Evening in Lausanne on the topic of Sustainable Consumption. Am 15. Februar 2018 kamen in Bern 250 Menschen zusammen, um das Sustainable Development Solutions Network Schweiz SDSN zu lancieren und um die Schweiz einige Schritte weiter in Richtung Agenda 2030 zu bewegen. Selten genug treffen so viele Menschen mit so viel Wissen und Erfahrungen zusammen. Diese Chance galt es zu nutzen. Aber wie? Das Hostingteam der Konferenz in Zusammenarbeit mit collaboratio helvetica hat sich für das Lernen von Geschichten entschieden. Methodisch fiel die Wahl auf das Collective Story Harvesting. Klingender Name – und was darf man sich konkret darunter vorstellen? Every now and again we bump up against a personal learning threshold, be it more or less consciously, sometimes for what feels like the gazillionth time. At times we’re hungry to find and face the next one to level up self-awareness, other times it can leave us feeling vulnerable to share what can touch upon deep confusion, self doubt, frustration or alike.